Scholastic Teaching Resources (Teaching Strat, 9780545374903, 128pp. 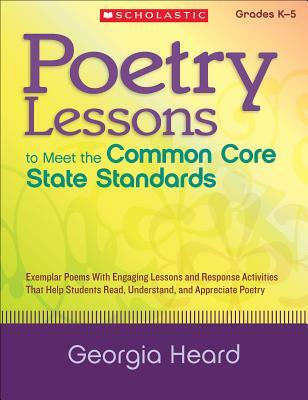 Favorite poet and author Georgia Heard shares step-by-step poetry lessons that guide students to identify figurative language, hear rhyme, rhythm, and other poetic conventions, and explore imagery and theme—and then determine how these elements deepen their understanding of the poem. Students gain a thorough knowledge of poetic elements, which helps them meet Common Core State Standards in literature and language. Includes model poems, response activities, and performance tasks! For use with Grades K-5. Georgia Heard is a founding member of The Teachers College Reading and Writing Project in New York City. She is the author of six professional books on the teaching of writing and several children's poetry books, including her most recent anthology The Arrow Finds Its Mark: A Book of Found Poems. This is her first book for Scholastic.